The counter-consensus to quasi-scientific hype and induced panic on climate change is at last assembling. 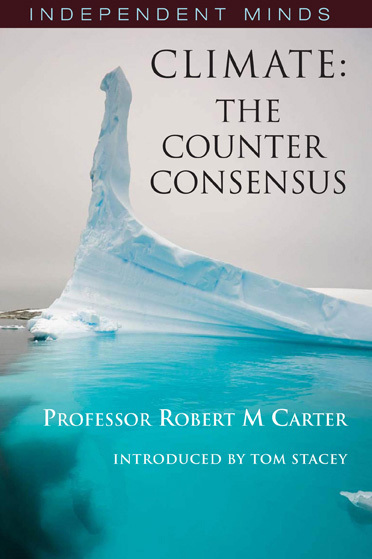 Climate: the Counter Consensus examines, with thoroughness and impartial expertise, the so-called facts of global warming that are churned out and unquestioningly accepted, while the scientific and media establishments stifle or deride any legitimate expression of an opposing view. Please follow this link to the author's web page, which contains passages from review coverage and many interesting links. Professor Robert Carter - Professor Robert Carter is one of the world's leading palaeoclimatologists, and his work investigates the past cycles of the earth's unpredictable natural climate change, especially over the last few million years of planetary ice ages. Tom Stacey - Author of Tribe, The Pandemonium, Bodies and Souls, Deadline(filmed for television with John Hurt), and The Worm in the Rose. He is the author of seven novels, including the seminal work The Brothers M, partly set in Ruwenzori. Other works include collections of short stories and two books of remote travel. He is the winner of the John Llewellyn Rhys Prize and of the Granada Award as Foreign Correspondent of the Year, and is a Fellow of the Royal Society of Literature. He is married, has five children and many grandchildren, and lives in Kensington and North Wales. For more information on Tom Stacey please visit his website.